Over the past years Microsoft focused mostly on providing the market with the right devices. Because other device producers didn’t do well enough, Microsoft bought Nokia and developed their own Surface. The Nokia acquisition wasn’t successful and it made Microsoft realise it has a different purpose. 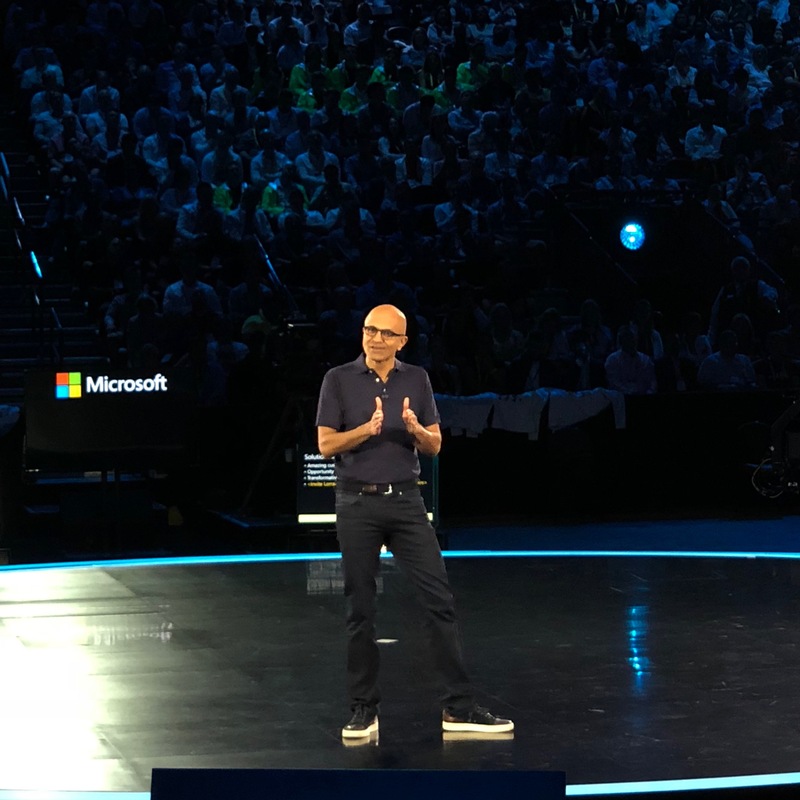 During Microsoft’s yearly partner event Inspire in Las Vegas, Satya Nadella, Microsoft’s CEO clearly showed Microsoft’s new ambition: experience centric development to empower every person and every organization on the planet to achieve more. Satya Nadella mentioned that this mission goes really deep. When he is having job interviews with young graduates, he informs them that there is no place available for people who want to be cool, because Microsoft aims to let their clients look cool. “It’s the success of our clients that makes our eco-system unique”, is how he started his keynote. Organizations around the world embrace digital transformation and a new modern workplace fueled by cloud, artificial intelligence, mixed reality and the Internet of Things. To enable this transformation, Microsoft offers and continues to develop an Intelligent Cloud with an Intelligent Edge of connecting applications. This Intelligent Cloud has to provide People-centered experiences, based on AI and Ubiquitous computing. A people centered experience means that solutions should support the individual in managing their relationships through activities & tasks, multi-sense and multi-device. This experience is most noticeable in gaming. For Microsoft both the Xbox and more recently the acquisition of Minecraft have served well in gaining a better understanding of the right people-centered experiences. And people want to have a similar gaming experience in the office. Microsoft delivers the modern workplace based on Microsoft 365, a full suite of productivity and collaboration applications. Dynamics 365 should support businesses in being efficient and customer centric. An example of the execution of this model was provided on stage. Carlsberg is going through a transformation based on a strong partnership with Microsoft. For them this model looks as follows. As Satya Nadella wrote in his book “Hit Refresh”, a culture change within Microsoft and its eco-system is needed to achieve this. A growth mindset is essential and core elements of this culture are being: customer obsessed, diverse & inclusive (creativity needs an open mind, a diverse work environment stimulates creativity) and One Microsoft. During Inspire the core elements of the strategy were clearly showcased. To enable the modern workplace, Microsoft 365 was demonstrated and discussed, Dynamics 365 is the enabler for business applications and there was a lot of attention and discussion around Data & AI. Many powerful solutions making use of all of these new opportunities and providing the user with an amazing experience are being expected soon.